Ukrainian "unicorn" to be, but not in Ukraine! StartupNetwork.USNews & articlesUkrainian "unicorn" to be, but not in Ukraine! The Unicorn, it’s a startup, valued at more than one billion dollars. For the first time this term was used by famous venture entrepreneur, Eileen Lee in 2013. At that time there were already 39 “unicorns”. Today, there are 229 of them in the world, their total value is 800 billion dollars. While everyone talks about “unicorns” and for many entrepreneurs the status of a startup for a billion has become an end in itself, only a few know about the concept of "cockroach startups". Cockroaches Startups, it’s those who have learned to earn money, despite everything. Also known as called hard-to-kill. 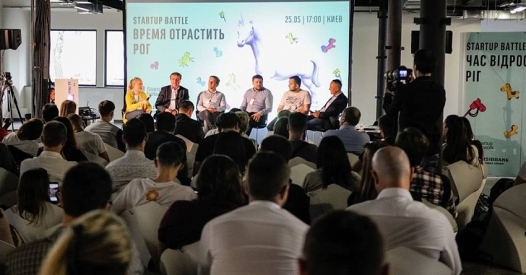 The participants in the panel discussion at the Startup Battle, "The Time to Grow a Horn", which took place in Kiev on May 25th, spoke about how to turn a “cockroach” into a "unicorn" and whether it’s possible in Ukraine. In Silicon Valley, they say that instead of chasing "unicorns", you need to focus on "cockroach startups", what do you think about that? Evgeny Sarantzov, MBF Master Banking&Finance KMBS: Fully agree. Ukraine is the country of “cockroach startups”. The venture capital market is not as developed as in the Valley, and, therefore, there is practically no chance of becoming a "unicorn". Dmitry Lisitsky, CEO of the global marketing solution based on artificial intelligence Influ2: I think that there are terms confusion. It seems to me that here is the terminological confusion. First, venture funds are chasing unicorns, whose financial model does not allow investing in other start-ups. Secondly, every "unicorn" in his youth is a "cockroach". Vladimir Dubinin, CEO of Distributed Lab: Any investor in every "cockroach" coming to him wants to see a potential "unicorn". Therefore, cockroaches stay cockroaches, but investors are still looking for "unicorns". Valeria Zabolotnaya, Head of UNIT Factory: We all perfectly understand that all this qualification is very conditional and to make pragmatic assumptions and think "unicorn" this or "cockroach", or how a "cockroach" can become a "unicorn", is not worth it. Of course, everyone dreams to grow fast, but actually Ukraine’s problem is in fact that we have a lack of “cockroaches”. So let's just grow "cockroaches" adequately, and then we will move on. Today, already 20 countries can boast of their "unicorns", Ukraine is not on this list yet. But do you think that we will have a startup for a billion? Or maybe we already have one, after all, not so long ago Grammarly raised a lot of investments, and no one knows by what assessment? Evgeny Sarantzov: Here, rather, the conversation is about creating a "unicorn" with Ukrainian roots, because in any case it will be somewhere in Delaware or China. The Ukrainian "unicorn" will be, in this I believe, because we have a lot of fairly intelligent and stubborn developers. But first we need to get rid of the younger brother's complex and stop being afraid of going to the "big leagues". Dmitry Lisitsky: From bad news - now in Ukraine to create a "unicorn" is impossible, so I agree with my colleague that there may be a company in which one of the founders will have Ukrainian roots, which is also not bad. From good news - if you look at the startups that have appeared in the last few years in Ukraine, you can notice a big shift. Our bad economy has actually helped many local companies, in that founders began to think about how to enter global markets. It is unlikely that any of you now will recall a technological company from Germany, but all because there is a large domestic market. But in Israel, on the contrary - there is almost no domestic market and entrepreneurs are initially oriented to the global market. Ukrainian entrepreneurs have shifted their thinking and this is the soil where a potentially big business appears. Valery Zabolotnaya: In Israel, among other things, such a large number of successful startups, also because the state supports entrepreneurs in the process of creating small "cockroaches" and turning them into "unicorns." We unfortunately, really have a lot of restrictions, both legislative and tax, to deal with unicorns, so let's move slowly. Andrei, I know that you personally met Bill Gates, after you sold him your company, what impression did he make on you? And did he have an invisible horn? Andrei Bezgubenko, President of E-Consulting: The first time I met Bill, I immediately realized that this person does not belong to himself. Everything is painted by him every minute, a bunch of assistants make decisions for him, I'm not even sure whether he thinks himself. And I wouldn’t want to be Bill Gates, when you don’t have a personal life, all you have is just work and you are handcuffed to some sort of stream of events on the assembly line. But, at the same time Bill is a very interesting person. Vladimir, now the question to you, when do we expect a "crypto unicorn" or is it already there? Vladimir Dubinin: The market of crypto-currencies is just the market that is now in a crazy state. From the beginning of the year it unrealistically jerked. For today, its capitalization is $90 billion, in January it was only $20 billion. If this goes on, then I think in two months you can expect the appearance of a "unicorn". If you were about to write a book, "Handbook for Dummies, or how to create a Unicorn", what would you write there? Vladimir Dubinin: Ben Horowitz wrote the book "The hard thing about hard things", I think that it is an ideal substitute for the book you have just mentioned. Evgeny Sarantzov: I would suggest you invest in ideas that do not have consensus at all, which most people do not agree with, and you still want to invest in it. I believe that this is how "unicorns" appear. Dmitry Lisitsky: My book would consist of one page, on which it would be written - you need to clearly know what you do not know, understand your limitations and do not listen to fools. Andrei Bezgubenko: I would advise you to do only what you believe, where you can prove your point of view, the perspective of the prospects and for which you are ready to gnaw through your neighbor's throat. Valeria Zabolotnaya: We need to be prepared for failure, turn that into something constructive, hear and listen, be ready for radical changes and not fall in love with your own idea.